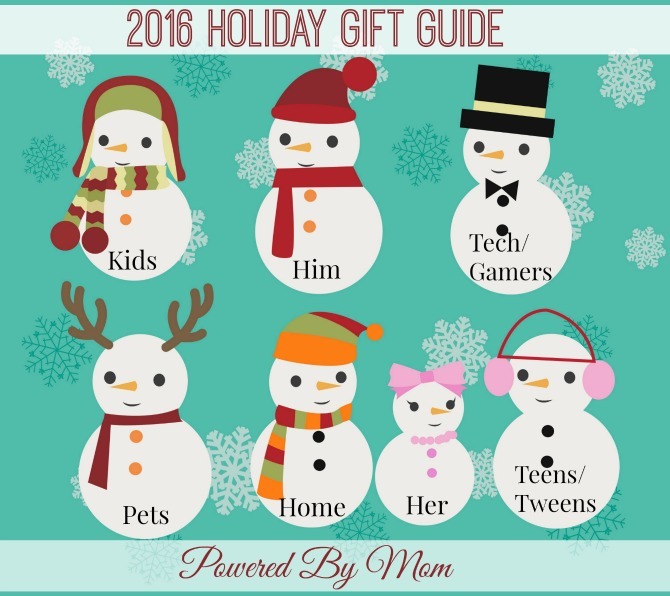 Powered by Mom’s 2016 Holiday Gift Guide for Family. If you’re looking for a gift that would be great for the whole family this is your gift guide! We will be continually adding to this guide so make sure you come back often to see what we’ve added. We’re just getting started and have so much to add. You can click on the snowmen below to get to the different categories of our Guide. We hope you get some fabulous ideas for this gift giving season. If you have some great gift ideas, feel free to leave us a comment on what you think would be an awesome gift guide suggestion. Keep warm in the winter, cool in the summer & your air purified all year with the Dyson Pure Hot and Cool Link. We put the Dyson Pure Hot + Cool Link Hepa Air Purifier, heater & cooling fan in our daughter’s room. Her room is the coldest in the winter and hottest in the summer. This past summer it was so hot that even though we tried to cool our house down with our central air during the day my daughter was still too warm at night. Now with the Dyson Hot + Cool Link her room will be perfect all year long! Read our review of this fabulous machine HERE. Christmas is a time of giving and it only makes it more special when I can give to my loved ones and help others at the same time! It is one of the reasons I love World Vision so much! The other reason is that they have amazing handcrafted products that are perfect for everyone on my list! Want to really clean your home? So many of the cleaners on the market today can cause more harm than the “cleaning” they actually do. ECOS has the solution for you. Green cleaning! Laundry detergent, pet shampoo, hand soap… anything you need to clean – they’ve got you covered! Thermos for the whole family. I love gifts that will also help my family like Thermos products my daughter can use to have a lot lunch at school or keep her water cold. Hubby who works at different job sites even in our snow weather really appreciates Thermos items like their Vacuum Insulated 16 oz Food Jar with Bowl and Spoon. He can warm himself up with a tasty meal so he can keep up with his hard work for the day. I’m always amazed at how well they work to keep what needs to be hot well hot and keep our drinks cold all day long. So everyone is getting a Thermos items to use in the new year. The kids will also love the Finding Dory and Star Wars Thermos items in their lunch bags! The Halo Rover is the Worry Free Hoverboard. It’s a fabulous unit for the entire family to have fun on while they learn together how to maneuver the Halo Rover. It’s stable and has beginner modes make it easy for everyone as they learn to use it. It even has bluetooth speakers so you can have your tunes on while having fun riding it. It’s an amazing gift for the holidays but one that the whole family can enjoy. The PureGuardian® Aromatherapy Essential Oil Diffuser uses ultrasonic technology. It’s Simple! Just add a few drops of essential oils to the water and the ultrafine mist will quickly and continuously fill the room with the natural oil aroma. The diffuser is quiet and won’t disturb you when you’re sleeping. Simple, clean design includes touch control for power and optional night-light. It’s lightweight and compact, making it great to put on small nightstands. The 100ml water reservoir is BPA free and treated with Silver Clean™ Protection, which fights the growth of mold on the surface of the tank. Purchase yours today! If you’re looking for an affordable rice cooker than look no further than the Roseweill Rice Cooker. Right now you can get it on Amazon for less than $68! For a rice cooker and warmer with all the options on it that’s a steal! Get it HERE on Amazon. As someone who travels quite a bit for work and also enjoys long and short trips with my family, luggage is always a gift I love to receive and give. One of the most important pieces of luggage for me is a carry-on suitcase as it holds my essentials and valuables that I don’t trust to check in. It’s also sometimes the only piece of luggage I take with me on shorter trips to save myself time from having to check in luggage and then wait for it at my destination. If you need very lightweight luggage with tons of style and features, choose Passion. The Passion carry-on is your perfect travel companion. You will love how ultra lightweight Passion is. Passion has a beautiful structured soft-side frame and convenient exterior and interior pockets that help you pack efficiently. Plus, iFLY’s expansion feature let’s you maximize your packing space. With 4 easy-spin wheels that provide smooth 360o navigation, getting around is effortless. Quantum Vac – Experience the Cleansing Power of Water! If you’ve been looking for the most powerful vacuum, that won’t lose suction then you want to check out the Quantum Vac. It’s the vacuum that uses water, yes water but when you see how powerful it is you’ll be amazed. It’s less expensive than some the big name brands and their powerful vacuums. No dirty canisters or paper bags to change – and other vacuum cleaners stop working effectively when their filters clog! Quantum Vac Pro is a vacuum cleaner, air purifier, mini vac, wet/dry vac, blower, inflator & deflator – ALL IN ONE! This smart 5.5-cup rice cooker and warmer features advanced Neuro Fuzzy® logic technology that enables the unit to ‘think’ for itself and make fine adjustments to temperature and heating time to perfectly cook rice every time. We love Disney movies and Alice Through the Looking Glass was no exception. It’s a new adventure for Alice as she tries to save her friend the Mad Hatter. Get it on Amazon HERE. Bringing THE BFG To Life — Take a phizz-whizzing journey through the making of the movie with Ruby Barnhill (“Sophie”)|The Big Friendly Giant And Me — A short about the friendship between the BFG and the little “bean” who lived in Giant Country before Sophie|Gobblefunk. Give the gift of delicious quality treats like those from Royal Hawaiian Orchards. From their chocolate covered Macadmian nuts to their Macadmian Milk! They believe that a long, healthy life begins with a well-balanced diet full of wholesome, all-natural foods. Did you know that Hawaii boasts the longest average life expectancy in the U.S.? Hawaiians credit their longevity to healthy eating, happiness, and stress-free living. We are thrilled to share our review of these soft and comfy sheets that we received from Peachskin! This time we got the midnight black sheets for my daughter. Like many teenagers she has a black theme in her room but she does have other colors in there as well. I actually quite like what she has in her room and now she’s super happy to have some super soft, breathable, wrinkle-free, Anti-Microbial sheets that also wicks away moisture! Between the cold weather and the heating, humidity levels naturally drop and we need some of that moisture for oh so many reasons. Thankfully the Dyson Humidifier that we received has resolved our dry air issues. Coffee is a magic word for me! I love all kinds, from hot coffee coffee to iced coffee. Now, I can enjoy whatever kind of coffee I am in the mood for in a matter of minutes in my own kitchen! With the amazing Ninja Coffee Bar Brewer System with Frother, I can also avoid paying the high price of coffee from a coffee house by making my own creations! This amazing brewer does it all! It would make a fabulous Christmas gift too! Community Coffee is a family run company that’s been in that same family for 4 generations! They have beans, ground coffee and single serve, they scour coffee farms for the best coffee beans out there and I have to say they’re doing a fabulous job! Community Coffee is a company with values and integrity and serving their customers and their local communities is their privilege. They truly are a community coffee! If for some reason coffee isn’t your thing don’t worry they have tea too! The Nutri Ninja Blender System makes it easier and quicker for you to make delicious, nutritious meals, smoothies and more. Are you sick and tired of being sick and tired? Give Beauty Infusion and Glow Matrix a try! Every candle is hand poured with exuberant amounts of love, bottled with grace and shipped through prayer. Let NutriBullet LEAN help you be the healthiest you can be! NutriBullet LEAN makes getting healthy easy and delicious! If it’s Yoga, Aurorae has it. From mats to towels, you’ll find anything you need with Aurorae! The NutriNinja Series of appliances realize that and have come up with a wonderful way to combine a food processor and a blender. The NutriNinja Duo Bowl has both smoothie blending cups (some kits comes with three) and a bowl in order to work like a food processor. Read our review HERE! Stylish Accessories from ToiletTree will Breathe new Life into your Bathroom! From shower mats and laundry hampers to fogless mirrors and razor dryers – if it belongs in the bathroom, they have it! Bright Endeavor sells an assortment of soy wax candles that are sure to make your home smell amazing! You will NOT want to miss checking out Razor’s Hovertrax 2.0. This is an amazing product with the first certified electrical system! Self-balancing and loads of fun!! Check out the video showing off this awesome product! With reasonably priced kitchen accessories, gadgets, and even small appliances, T-fal has got it all! My favorite is the Airbake cookie sheet, this rust free aluminum pan will keep the bottoms of all your holiday cookies from burning! Garden of Life uses the purest, most natural ingredients to form a great selection of vitamins, shakes, and supplements. Both children and adult vitamins are available including multivitamins, probiotics, and so much more. Protein shake mixes are completely organic and packed with a great source of vitamins! Get more storage and counter space with this My Flip Frame. The My Flip Frame resembles a Murphy bed. It looks like a beautiful picture frame, but when you pull the hinged picture down, there is a cupboard behind the picture where you can store whatever your heart desires. Make botanically infused butters, lotions, soap, alcohol, and a lot more with the Magical Butter countertop appliance. This small countertop appliance eliminates the hassle of making botanically infused products in your home. Start reaping the benefits of botanicals and essential oils with this easy to use machine. With 5 different settings you can create homemade goodness in just a few simple steps. You can make everything from infused butter, lotion, soap, and even tinctures! Do you have travel lovers in your family? Great gifts are available at 08 Left that use airport codes, NASA Codes, famous air traffic control towers and more to create t-shirts, hoodies, mugs, and even baby onsies. Winter can be a challenge for a lot of people with staying warm and healthy. Honeywell’s ceramic heater will keep you warm in the office, during a bath or even while you sleep at night. With safety features providing an auto-shut off, the heater will allow you to rest easy knowing just how safe it is to run your heater at night. Top-Fill Cool-Mist Humidifier by Honeywell will keep your lungs moist this holiday season. Help fight off sicknesses by adding this cool-mist humidifier to your home. Read more HERE! When we get a cold snap in Florida, we shorts wearing Floridians really suffer. The Honeywell HeatGenius Ceramic Heater has really helped keep up warm and cozy during our last few temperature drops. With additional safety features like tip-over and overheat protection, you can heat any room in your house quickly and efficiently while having peace of mind that your HeatGenius won’t get too hot! You have some really nice things on this list. I really want the PureGuardian® Aromatherapy Essential Oil Diffuser and the peach skin sheets! I really like the Disney Movies as a gift. It’s very family friendly and I don’t really know anyone who doesn’t enjoy a Disney classic every now and then. I’d love to have the Dyson Pure Hot + Cool Link Hepa Air Purifier, heater & cooling fan. Very useful. Lots of really great products here. Wish I could afford that Dyson Pure Hot and Cool Link. Love the Dyson Pure Hot + Cool Link Hepa Air Purifier, heater & cooling fan and because I am a huge coffee drinker the Ninja Coffee would be awesome! Thanks for the chance! I like the dyson humidifier with so much change in the air quality this I see definitely needed. I love food gifts so the Royal Hawaiian Orchard gifts would be a hit in my household. A taste of Hawaii during the cold winter months! I love the portable heater. It’s perfect for that one room in the house that always seems cooler. I really like the ric cooker. I make horrible homemade rice. With something like that I could actually do it. I would love to try the Quantum Vac to see how it would handle all the pet hair that I’m constantly struggling with from my 3 cats! So many great ideas; something for all families! My faves are the Dyson Humidifier, the Ninja Coffee Bar and the blenders… Thanks! I have an older air purifier and could use something like the Dyson Hepa Air Purifier, heater & cooling fan. Besides needing something that can do all three, it just looks cool–reason enough to check it out for myself. I enjoyed going through this list. ECOS cleaning fluids are something I would like to try. Just to keep things clean all around. I’ve always wanted a rice cooker. My cupboards are so full of gadgets…but I just might need to get one of those! I love the Dyson Pure Hot + Cool Link Hepa Air Purifier, heater & cooling fan. This little bad boy would help me eliminate two machines because I have a hepa filter, a fan and a heater and it would be great to have them all rolled up in one. Thanks for the review and calling our attention to this great product. I really like ECOS products and I try to use natural in my home. I have used ECOS laundry detergent and I like it very much. I love the Thermos jar. I wish I had found this years ago. As a high schooler, my daughter loves hot meals to take to school for lunch. This would fit the bill! The ifly luggage is top on my list. I love the 4 wheels. My dad had a vacuum like the Quantum and all of us kids hated it. It was so clunky and messy to dump the dirty water out. On the flip side, I think this is a great vacuum if you’re concerned about allergens because all the dust/dirt particles get trapped in the water. I really like Thermos products. That lunch bag was so cute too! The home category is my favorite and for me could be named the her catagory! I know that’s a little unusual! Oh, how I would love to have the Pure Guardian aromatherapy machine! It would be awesome to set the mood while I am coloring! I’m still shopping for an essential oil diffuser and like the PureGuardian® Aromatherapy Essential Oil Diffuser since it guards against unwanted mold that may want to form. I know I’ve commented but there’s always something else that catches my eye! I love the Zojirushi Rice Cooker! They last forever and this one has all the bells and whistles. I’d pack it all in the diaper bag! Diapers, burp cloths, bottles, wipes, pacifiers, clothes, toys, blankets, food, snacks, I want to be prepared for it all! I really like the Nutri Ninja Duo Bowl because it’s two appliances in one and a space saver! i think we would have fun as a family with the overboard. we would take turns using it. What a selection! I would love the Ninja Coffee Bar System with Frother among a few other things. I have been looking at this coffee bar system for awhile now. Hubby and I are both coffee snobs and how great would it be to have one? We live in a small town with no Starbucks..lol. Great guide and Happy Holidays! I especially would love love love these peachskin sheets..as would my Purdy Gurl who is still jealous of Bunnys picture on her new set. She wants to strike a pose too and share..haha..for real. I would love to have this new Ninja Coffee Bar System with Frother. My favorite coffees are lattes and cappuccino and with this I would be in coffee heaven. I enjoy the Bright Endeavor Candles. I like the fact that they are soy candles. I found it! I found it!!! The present for my sister in law!!!! The Rosewill Rice Cooker!!! Or maybe the Zojirushi Rice Cooker and Warmer. She has been on an elimination diet for SO long now and these would simplify her cooking process!!! Thanks!!!! Thank you for these great list of gifts. If you cant find something here…. you are not looking very hard. Guardian Technologies Essential Oils Diffuser–I’m hoping these are something like the Glade/Air wick/Febreeze plug ins? They fill the air with aroma and you just put a few drops of oil in it at a time? No idea, like the rice cooker, another product I’ve never used. I like my plug ins, at least for the first week. I see kits of essential oils everywhere and would love to try some to spice up the house. I mient to buy something last night and forgot. A Christmas smell since I don’t have a real tree….of course anything Pumpkin is great but mostly I go for Lavender in the house. I really liked the look of the Dyson Hygienic Humidifier. So modern. I love the BFG movie as a family gift for my family. We love to have family movie nights, and my daughter read this book this past year, and it was one of my favourites as a kid, so this would be a perfect movie for our family to enjoy together. My favorite catagory! Anything home is my favorite..especially kitchen..I love gadgets, dishes and cutting boards..collect them all. I’d also love good linens..and need a shark steam machine..id add that and anything from Pioneer Women home collection from Walmart so A Walmart giftcard please! I’m always looking for bedding and bath towels. I also like the hair care products. I would love to try the Neo cell beauty and health products. I like the Dyson Hygienic Humidifier because my skin gets so dry in winter. I would like to do an update to my kitchen, so a lot of your suggestions are really nice. You have a great list of goodies that are very friendly in all homes throughout. I would love the Nutra ninja bowl for my daughter. I am asking for the dyson humidifier for Christmas this year…I’m obsessed with it! All great and amazing products, I would love to have the Ninja coffee bar on my counter!! I’ve wanted a Ninja Coffee Bar System for a long time! It looks amazing! My sister would be so happy with the coffee basket! Great ideas. I have A Nutri Ninja with Auto IQ and I love it! Some really great picks here. The number one on my list would be the Dyson Humidifier since our place gets so dry. I would love the Ninja for Christmas because it would such a big help to me in the kitchen. I picked home, I would like to try the NutriBullet LEAN , it’s that time of the year. A new diet plan. I had never seen that Dyson has a humidifier. We are so needy of a humidifier in our home during the winter because of dry air. This looks wonderful and it looks like it is perfect for our place. I love the CircuitScribe Draw Circuits Ultimate Kit as we have artist’s(budding) in our family. this would be awesome for them. I would love a Dyson Humidifier! I love the Dyson Humidifier and would love someone to buy that for me for Christmas. I like the Nutri Ninja Duo Bowl! This would be awesome to have it in my home! I’d love to see some indoor plant systems. The ninja blender is something I’d like my nephew has one and he says they are great. I would love to have the Nutri Ninja Blender System with Auto-iQ Technology. This would be a gift for my husband, he would love it! Of course I would use it to. Love that you can make different coffee drinks. I’ve always wanted one of those Ninja Coffee Bars. They look so fancy and I love making mochas. In the Home category, I like the Nutri Ninja Blender System because I’d like to eat healthier. I know I’m supposed to be looking at these gift guides in order to buy for others, but…I really want that Dyson Hot/Cool Purifier. Talk about multi-purpose. I’ll buy presents later, haha. Some great products!! On my wishlist is the Nutri Ninja Blender System. I saw a demo at my Costco on one and it was amazing!! It made everything from ice cream to soup! I would love to own the Dyson Pure Hot + Cool Link Hepa Air Purifier, heater & cooling fan I love that it is a heater and fan in one dual purpose. I would love to have the Nutri Ninja BlendMax DUO this Christmas. I like the Ninja Coffee Bar System . This would be a perfect gift for my husband. He would love all the features! So many great things for the home! I would love a Ninja of any kind – I hear they’re one of the best. That Ninja Coffee Bar System looks absolutely awesome! I’d love one, even if I wouldn’t really know what to do with it or where to go with it. I think it would be fun to make the fancy drinks you get at coffee shops, though! I’d like to have the Nutri Ninja Blender System with Auto-iQ Technology because it’s so versatile it would free up my countertop. thanks for such awesome gift guide for home my most favorite one is Dyson Pure Hot + Cool Link Hepa Air Purifier, heater & cooling fan i have never tried this one so would love to gift myself this. I would love a Nutri Ninja! Another possible idea to add to this category is one of those vegetable spiralizers. Got one last year for Christmas and love using it. I would love the Nutri Ninja BlendMax DUO for my smoothies. I’d also love a new vacuum cleaner. I love the faithful scents candles! I love trying out new candle brands. I would like to get the Nutri Bullet Lean. We all could get healthy. I would love any of the Nutri Ninja products but my favorite is the coffee bar! I do think the World Vision Holiday Catalog Items would make perfect gifts. They are very unique and lovely. There are lots of great gift ideas listed! I’ve seen several items that I would love to have myself! Of all the different items, I would have to say the “Dyson Pure Hot + Cool Link Hepa Air Purifier”, located in the “Home” section, is my favourite! I just love that there are no blades to circulate the air. You can stick your arm right through the centre! It looks amazing! I’d love to have the Dyson Pure Hot + Cool Link Hepa Air Purifier, heater & cooling fan. Dyson is quality in my book. I’ve seen just the fans and they’re wonderful. And so quiet. This one is even better since it heats. I bet it keeps your room nice and warm! I want a ninja coffee bar! We cannot afford to forget about our beloved pets on such a special day! I thank you for bringing the best in suggestions for an adorable gift for the best friend in our lives. I like the Nutri Ninja BlendMax DUO! It would be a great product to have! The Nutri Ninja Blender System with Auto-iQ Technology would be a wonderful gift. I like all the new features it has and thatt would make for some wonderful smoothies! I would love to be able to make all kinds of coffees with the Ninja Coffee bar. That is going on my wish list. That ninja blender is actually just the one I want and need. I would love to have the Nutri Ninja Blender System with Auto-iQ Technology . I could make some great drinks with this. I love the Dyson Pure Hot + Cool Link Hepa Air Purifier, heater & cooling fan. Some of the rooms in our house have very poor air circulation so this would be so great to have. I love that it’s a air purifier, heater and cooling fan in one 🙂 Very convenient! The Ninja Blendmax would be used a lot at our place. Ninja Coffee Bar System this looks amazing to use. We drink lots of coffee in our home we make it a couple of times a day so this looks like it makes great coffee I love soy milk in my coffee so blending it seems so easy with this. I think the Dyson Pure Hot + Cool Link Hepa Air Purifier, heater & cooling fan would be a great gift. I know I could definitely use it, and other people with pets would love it. I would love to get the Nutri Bullet Lean,I’ve been wanting to get one for my son for Christmas,it’s on his wish list,he wants to start eating healthy and make some smoothies and this would help so much. Ninja coffee bar has my name all over it! That Ninja Coffee Bar has my name all over it. Awesome! So many wonderful items here to think about for Christmas , I think I would also like to see flameless candles on this list, I think they would be a wonderful gift also. The Ninja coffee bar system looks fabulous and I deserve it for being a devoted wife and mother!!! These are great suggestions. I really want to check out the Dyson Pure Hot + Cool Link Hepa Air Purifier. I could use it. Ont thing I think you should add to the list is a multicooker. I got one recently and honestly don’t know how I lived without it. I plan on buying one each for a couple of friends and family members. I love to have a Nutri Ninja system, so much I can use if for. I would love to have the Nutri Ninja BlendMax DUO. I could make some delicious smoothies with it. I need the NutriBullet lean. It would be great for making protein shakes and smoothies! I think my favorite is the Nutri Ninja system because it can be used for so many foods or drinks for the entire family. Ninja appliances are the best, so much attention to detail in their design. I really like the Dyson Pure Hot + Cool Link Hepa Air Purifier, heater & cooling fan. With lots of allergies in our family this would be great for us! The Faithful Scents candle would be my favorite. I think candles make great gifts for christmas or birthdays. Wow, the Ninja Coffee Bar system looks incredible! Another fun gift for the home is personalized welcome mats. It’s hard to choose my favorite, because all of these are great. I could really use the Nutri Ninja BlendMax DUO though. I drink smoothies for breakfast and something like this would make mornings a lot easier. I would really love to try the Dyson Pure Hot + Cool Link Hepa Air Purifier, heater & cooling fan, it sounds amazing! Faithful Scents Candles–because candles are always a good gift. the Ninja Coffee Bar system is a great gift… I know so many friends I would love to give it to…. The ninja blender is top on my Christmas list this year!!! I always like candles. Especially jewelry candles. I always burn them until I can dig the ring out. I saw the majestic oil products in sally beauty yesterday and they smell great ! I would like to see a cameo 3 under my tree, and I think a lot of other people would too. The Nutri Ninja Blender System with Auto-iQ Technology would make a wonderful gift, everyone I know who has one loves it. And it would be great for so many things! I would like to have the Dyson Pure Hot + Cool Link Hepa Air Purifier, I have 2 cats and a dog and it tends to smell like animals in my house and I think this would help. I like the Ninja Blender. We just bought a new home and this would be great to have in the kitchen. The Nutribullet LEAN is awesome and would love to have one. Love the Dyson Pure Hot + Cool Link Hepa Air Purifier, heater & cooling fan. I have a Dyson vacuum and love it so much, would love to try other products of theirs. I would really love to receive the Ninja Coffee bar as a gift. I would really love to read review on the Dyson Pure Hot + Cool Link Hepa Air Purifier, heater & cooling fan. It looks interesting! I like accent pieces, throw rugs, pillows, things like that. Anything that can be changed up easily with the seasons, and easy to wash.
Smart home products would make an awesome addition to the holiday gift guide! I love the Ninja Coffee Bar Brewer, I have gotten two for Gifts this Year, but I also want one! Thanks for the awesome Gift Lists! Love the Ninja Blender! Would use it for sure daily! I think that Dyson’s products are kind of overpriced. I still like to know more about the Air Purifier. You just KNOW that the Dyson Hot/Cold Air Purifier is going to be a good product. Can’t wait for your review. I am very interested in the upcoming review on the Dyson air purifier and heating / cooling fan. It looks like it has so many functional features that I am wondering how well it works. Nutri Ninja Blender System with Auto-iQ Technology. I would use it every day to make protein drinks and fruit smoothies. The timer counts down and allows you to do other things while you wait for your fresh smoothie. I love everything about it. I like the Nutri Ninja Blender System with Auto-iQ Technology because it would be AWESOME to have such a blender! I would love to try that ninja coffee bar but it sure looks expensive ! I love the candles , candles make great gifts for just about everyone. And you can add then to a themed gift for a special touch. I love the Ninja Blender System!! The Dyson Air Purifier looks great. I can’t wait to see your review. We have been talking about getting one of them for our living room. I would love the Nutri Ninja BlendMax DUO. My husband has finally gotten onto the smoothy wagon and this would be a perfect guift for him!!! I would like Santa to bring me the Nutri Ninja BlendMax DUO — I would use it to make smoothies and malts. I would choose the Dyson Pure Hot + Cool Link Hepa Air Purifier. Dyson’s silent technology combined with the heating and cooling properties make this a perfect addition to my 50+ year old house where dust accumulates overnight. Tweens/Teens love tickets and iTunes Gift cards. I just love that world visions candle holder. I had to go to their site just to look. I am really looking forward to your review:) What about some kind of holiday decorations for the home? I love the ninja blender it blends so fast and powerfuk.. I would like to try the majestic products ! I would love to own the Nutri Ninja Blender System with Auto-iQ Technology, we have been talking about juicing and smoothies for a snack for a long time. We are coffee lovers and my machine will probably not last a lot longer. I’ve researched and love love this Ninja! It does everything. It’s in QVC tonight for today special..less than $100 with lots of extras even coffee..a great deal. I would really love to have the Dyson Pure Hot + Cool Link Hepa Air Purifier, heater & cooling fan. Everything you need in one product. I think the ninja coffee bar system would make a great gift! I love candles, warm throw blankets and lots of doormats. I hate cleaning up mud and sleet that gets tracked in. l Iiike to try the Dyson air purifier our family lives in a royal area with lots of dust around. This is a nice collection. Mostly, though, this year I am looking for more storage type containers. Ones that look nice and actually help stash some of the “stuff” and toys out of sight. You have a pretty good selection. I’d like to see some area rugs and accent pillow for the sofa. Small items that add a splash of color. The Ninja coffee bar looks so amazing. That would be an amazing gift because it’s not something everyone would get themselves. So many nice things. I really love the Ninja Coffee Bar System and the Dyson Pure Hot + Cool Link Hepa Air Purifier heater and cooling fan. The Ninja Coffee Bar would be so great to have to try making different ways to make coffee that I have never tried before and I have always wanted a fan like the Dyson fan, it does so many different things…. I would really love to own a Dyson Pure Hot + Cool Link Hepa Air Purifier, heater & cooling fan!! I’ve wanted something like this for such a long time 🙂 We don’t have AC, and our heating system is outdated…this would be so perfect! The Dyson fan/humidifier looks awesome! I love that you can use it all year round and that it is so safe around kids. The ninja coffee bar would be a great gift we would all use. I like the Nutri Ninja Blender System with Auto-iQ Technology. We are trying to stay healthy by eating healthy and this system would be a great help. The Dyson Pure Hot + Cool Link Hepa Air Purifier, heater & cooling fan excites me the most right now on the home holiday gift guide. Mostly because I’ve actually been looking at them. They’re just soo expensive, which is why I hesitate so much. Can’t wait to see your review on it, though! Socks that have different animals on them. Hubby buys me that stuff all the time and I love it! I think throw pillows or an area rug would make a great gift idea for the home category! I like the Ninja Bar Coffee system. I would love to see a Scentsy warmer in the home section. All the Ninja products are definitely on my wish list!! The Ninja Bar!I love a nice cup of coffee! The Nutri Ninja Blender System with Auto-iQ Technology would be an amazing gift for my daughter and grandchildren. They love all types of fruits and vegetables and she recently mentioned to me that she wished she could make more smoothies. Her old blender is not really up to the task and a Ninja Blender is at the top of my list of a possible Christmas gift for them. The lite for the children is cool,my grandson would go nuts for it. The Ninja Coffee bar, just imagine what you can make with that system. It would be so much fun to make all sorts of different coffee drinks! I love the night lights for kids that project the stars all over the ceiling and room. My granddaughter loves science and still loves to have a night light at night to go to sleep. I’d love to see one of those huge wall unit kitty tree/gym in your pet section! I would really like to catify my house more!